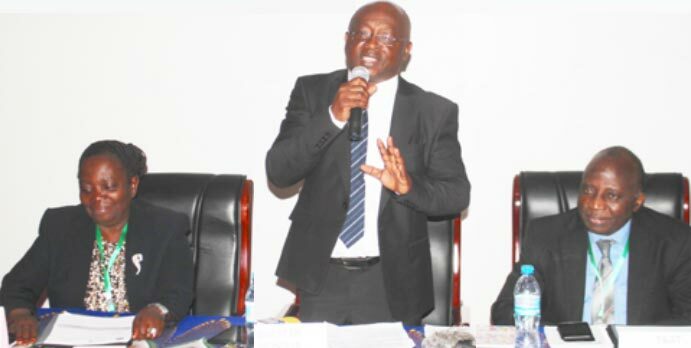 The Cassava Compact of the Technologies for African Agricultural Transformation (TAAT) led by IITA and funded by the Africa Development Bank (AfDB) has initiated activities in Tanzania, with a three-day national stakeholders’ workshop. Guest of honor, Prof Siza Tumbo, giving the opening remarks. The meeting was convened on 16–18 October by IITA in partnership with the Tanzania Agriculture Research Institute (TARI) and the Agricultural Sector Development Program (ASDP II) and brought together policymakers, researchers, the private sector, and farmers in the country’s capital, Dodoma, to develop a high-impact plan for transforming cassava in the country and contribute to its agriculture-led industrialization agenda. The meeting was facilitated by the Tanzanian Deputy Permanent Secretary of the Agriculture Ministry Prof Siza Tumbo who welcomed the initiative. He noted that while cassava was the second most important subsistence food crop after maize in Tanzania, with 84% of the total production going into food consumption, its production levels were very low. “Cassava has many other attributes and potential markets which we are not exploiting as a country including being a source of raw material for industries both in and out of the country,” Prof Tumbo said. The TAAT Cassava Compact seeks to achieve rapid cassava intensification through raising farm-level productivity, improving the efficiency of processing, and increasing market opportunity for the actors. It is part of continent-wide TAAT initiative under the AfDB’s agricultural transformation agenda, Feed Africa. “This program will scale out proven technologies to transform cassava in the country into an industrial crop and address challenges facing cassava farmers in the country. These technologies include high-yielding improved varieties, integrated pest and disease management, processing and value addition, and use of fertilizers among others,” said Dr Geoffrey Mkamilo, TARI Director General. During the meeting, presentations were made by the various actors along the cassava value chain including ongoing research initiatives to develop improved high-yielding varieties and tackling pests and diseases, processing and value addition, establishment of clean seed systems, and weed management. The participants also mapped the ongoing cassava activities across the country and identified areas with the largest concentration of activities and actors along the cassava value chain leading to the formation of four ‘agripoles’ in the Coast region, Eastern region, Western region for Kigoma, and one on cassava seed systems. The agripoles bring together all the actors along the cassava value chain and help to identify gaps and how to address them. Also they ensure that all actors along the value chain benefit equitably. “Through the agriploles, we will introduce both the technologies and technical support to make investments in cassava a profitable venture. The technologies include improved high-yielding and nutritious varieties, business-efficient and effective integrated pest and disease management options, good agricultural management practices, and appropriate mechanization,” said Adebayo Abass, TAAT Cassava Compact coordinator and a value chain specialist at IITA. TAAT will also introduce technologies to process cassava into food products, starch, and flour which could be further processed to high-value products such as sweeteners, adhesives, biscuits, noodles, bread, and cakes. Participants at the cassava stakeholders meeting in Tanzania. With an annual production estimated at 6.8 million tons, Tanzania is the 12th largest producer of cassava in the world and the sixth largest in Africa following Nigeria, DR Congo, Ghana, Angola, and Mozambique, respectively.